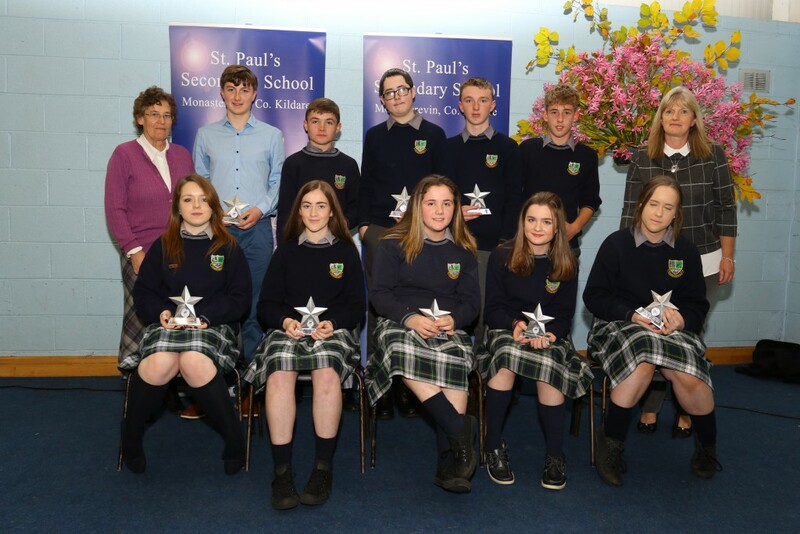 St Paul’s Secondary School Monasterevin hosted their Annual Awards Night for the academic year 2015-16 on Friday the 11th of November 2016. A large crowd of invited students, parents, staff and sponsors were there to acknowledge the sporting, active student and academic achievements of the students. The evening started with words of congratulations for the students, their teachers and their parents from the school patron Bishop Denis Nulty and Principal Brian Bergin. 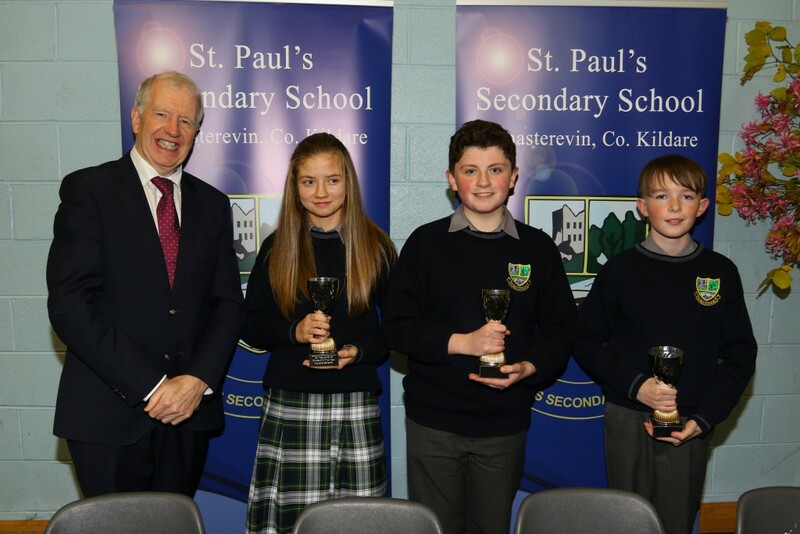 The emcee for the night was teacher Ms Aine Doyle, and she firstly called on last years’ Meitheal leaders and the winners of the John Paul II Awards for their awards which were presented by Bishop Denis Nulty. The prefects from 2015/16 were praised for their assistance during the year and received their trophies from Mr Bergin & Ms Mullally. Those with perfect attendance received trophies to mark their achievement. Two Special presentations were made to former teacher Sean Ryan and retired PC treasurer Geraldine Carroll by Bernie O’Gorman, Chairperson of the Parents Council. Tori Maher (2nd Year POY). In addition the Cadette Girls basketball received their Regional Runners Up medals. 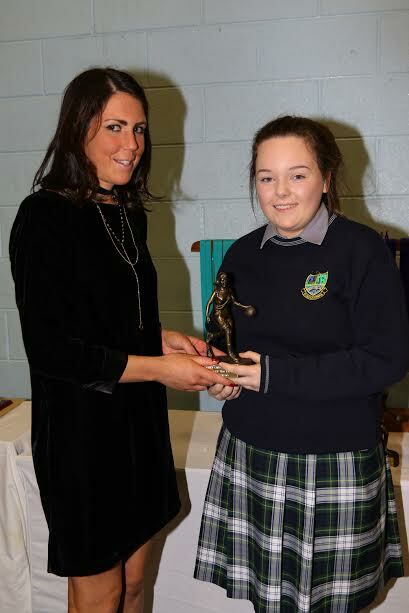 Senior Player of the Year Annie Curran received the inaugural Senior Girls Basketball Perpetual Cup kindly sponsored by retired teacher Mr Gerry Mahony. Cross Country Kildare schools silver medals were presented to Clodagh Brophy, Orla Hartigan, Juliette Boland and Christine Worrell. Cross Country awards were presented to Mark Sealey and Darcie Murray. The Beep test awards for fitness went to both Darren Prendergast and Lauren Kelly for the second year in a row. The B.O.M. scholarships winners for Irish and French were presented with a school medal memento by Mr. Noel Merrick, the 5th Year Irish Scholarships medals went to Laura Cleary and Michaela Broughall, 5th Yr French Scholarship medals went to Ciara Fanning Siney and Ella Campi. Kildangan Stud have kindly sponsored this bursary which will provide funding of €1500 per annum and a laptop for a 4 year third level course. All 6th Year students were eligible to apply for this bursary. Gerry Duffy, Manager at Kildangan Stud, presented the bursary to Hannah Duffy. The TY Spirit Award was presented by TY Co-ordinator Paul Marron to Eilis Hogbin. The next award presented was the School Spirit Award, which was presented by school Principal Brian Bergin. Each year an outgoing Leaving Certificate student is acknowledged for the positive impact they make on life at St Paul’s, and this year’s recipient was Eoin Cunningham. The final awards of the night were the Board of Management Leaving Certificate and Junior Certificate Student of the Year Awards , which were presented by Bishop Denis and Teresa Miley from B.O.I. Monasterevin , to the students who achieved the highest grades in the State exams in 2016. The Junior Cert winner was Alina Tee. The Leaving Cert winner was Oran Kavanagh. We thank Mel Doyle (photographer) and all who helped in making it such a great night.